My "The Playground of Possibilities" card deck is a tool for you to transform your old, limiting thoughts, beliefs and stories about yourself and the world, and take bold action. I don't want us to waste each other's time, so here are some clues that maybe we’re not a good client-freelancer match. Check out my free resource, "34 High-Integrity, Low-Cost Marketing and Branding Strategies for Soul-Inspired Entrepreneurs". And also take a look at my blog, Spotlight on Marketing, the place for us to share thoughts, opinions, questions and answers about marketing (especially marketing with integrity, from the heart). Looking for Some "Twitter Magic"? Are you still unconvinced about the value of Twitter for your business? Or have you created an account but don't know how to use it effectively? Ask me about my "Twitter Magic" tutorial. Explore and transform your thoughts, beliefs and stories about yourself and the world, tap into the abundance of the Universe, take bold action, improvise new ways of being, and play with like-minded, like-hearted friends. "You have a brilliant eye for this and you are very consistent. " 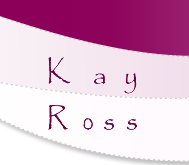 "Kay has a unique and valuable ability to capture the essence of what I say about how Orla helps people to be more organised, effective and productive. The result is powerful copy that makes sense to our prospective clients and, more importantly, inspires them to buy. She has a thorough knowledge of marketing concepts, and that shows through in every question she asks, every word she writes and every strategy she suggests. I'm also impressed that she insists on getting inside the brief and understanding our product, our brand and our clients before she puts pen to paper." I'm Kay Ross, a Hong Kong-based marketing consultant, editor and copywriter (that means I write the words of marketing messages - I'm not a copyright lawyer). 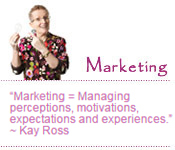 My company is Kay Ross Marketing. In my work, I call on my 30+ years of training and experience in marketing/editing/copywriting, in the performing arts (acting, improvisation and public speaking), and in the field of personal development/wellness/healing. The common thread that links all three of my passions (marketing, performing and healing) is: Storytelling. So I'll help you and your teams to find, craft and tell juicier, more resourceful stories about the past, present and future of your business, and to be more creative and innovative. Is marketing a mystery to you? I'll show you how to understand what your customers are really buying; craft compelling, shareworthy English-language marketing content; be a more effective writer, marketer and storyteller; look at every decision in your business from your customers' point of view, and give your customers good reasons to love you and rave about you. Need an actor, improv comedian, applied improvisation trainer, storyteller, MC, guest speaker or publicist for your play, film, commercial, party, corporate training programme, conference, PR event...? Call me. What would be possible for you if you told more resourceful stories about your body, your work, your life, your future, your relationship to the world...? I'll help you and your team to explore questions and techniques for a healthier, happier, more successful life and business.